The “Tango 12” designed by adidas and made of Bayer MaterialScience’s polyurethane (PU) materials will be the official ball of this June’s European Soccer Championship UEFA EURO 2012. According to Bayer’s press release, the surface texture of Tango 12 reminisce the structure of denim. Besides some interesting optical and haptical effects, it is also responsible for the particularly good flight properties of the ball. 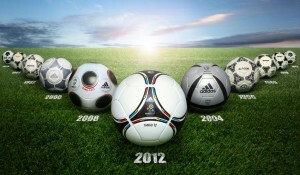 Bayer says adidas also aimed to make the ball even rounder and ensure it retained its appearance. Fewer cut edges and greater curvature also mean fewer seams and edges in the outer shell. Soccer players are more likely to strike smooth surfaces and can therefore control the ball with greater precision. Measurements of the diameter at 16 different points for each ball show that the deviation between the largest and smallest diameters is no more than 1%. “The outer shell of the Tango 12 consists of a total of five PU layers based on raw materials from our Impranil product line,” introduces Thomas Michaelis, Project Manager for Ball Development at Bayer. “These layers provide for optimal contact with the player’s foot and for very good control in all weather conditions.” The innermost layer is an adhesion coating that connects the textile substrate to the layers above. On top of this is a syntactic foam layer, roughly 1mm thick, made up of millions of gas-filled cells. The ball therefore quickly regains its spherical shape after being kicked, ensuring optimal flight, notes Bayer. The ball is finished off with three compact PU layers of various thicknesses. They make the surface resistant to external factors and abrasion, but also highly elastic, ensuring the ball retains its unique appearance over the long term. The individual panels of the ball shell are bonded together using patented Thermal Bonding Technology and thus absorb essentially no moisture. “Even in heavy rain, its weight increases by no more than 0.1%, which means that the players are able to control it better,” says Mr Michaelis. A raw material development is used too, according to the company. The thermoactivated adhesive is based on a waterborne PU dispersion from the Dispercoll U product line. The design of the adidas Tango 12 is reminiscent of the classic “Tango”, the ball used at FIFA Soccer World Cups and UEFA EURO tournaments in the early 1980s. However, a new feature is the reference to the two host nations Poland and Ukraine, which are represented by the colors of their flags. A graphic also recalls soccer’s key characteristics – unity, fighting spirit and passion. Another image is devoted to the ornamental art of paper cutting, a tradition in rural areas in both host nations. “No adidas ball had ever undergone such an intensive test phase as the Tango 12,” says Harald Körger, responsible for ball testing at adidas. Durign its two-year development phase, professional and amateur players from various clubs and associations from eight countries tested the ball’s quality in practical use and it was also subjected to comprehensive lab trials. Collaboration between adidas and Bayer dates back to the 1986 Soccer World Cup in Mexico.